2011 AFD 23.9, SD 6.0, CV 25.2% %>30:11.6%. 2008 AFD 21.0, SD 5.3, CV 25.2% %>30:6.4%. 2005 AFD 18.6, SD 4.5, CV 24.2% %>30:2.4%. Greys don't come along like this very often! 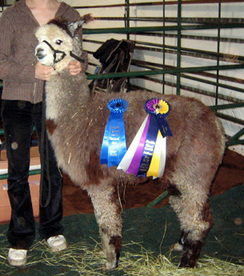 Divina took first in class and reserve champion two years in a row. 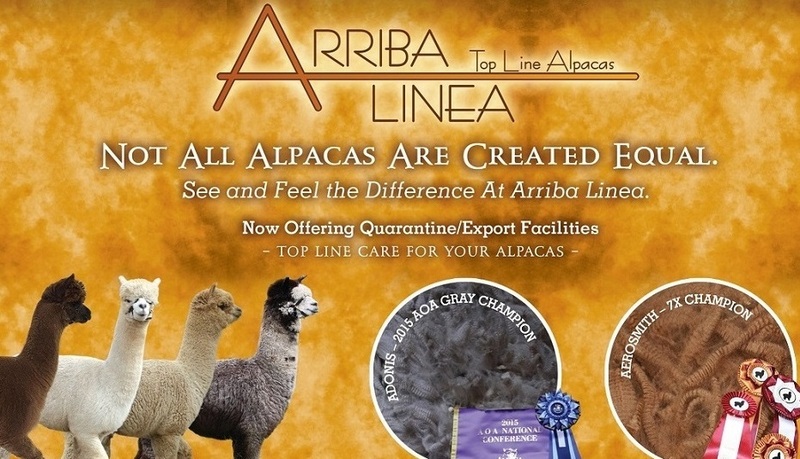 She has great conformation, excellent coverage and a fabulous fine crimpy fleece. 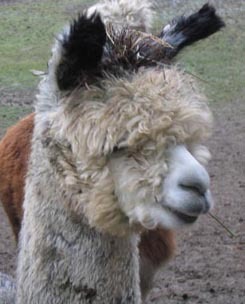 Her Jan 22, 2006 fleece stats were AFD 18.6, SD 4.5, CV 24.2% and fibers greater than 30 were 2.4%. Divina's true black full sister Willow, is a champion as well, so this girl has winning genes. Divina is passing on her Champion genes. 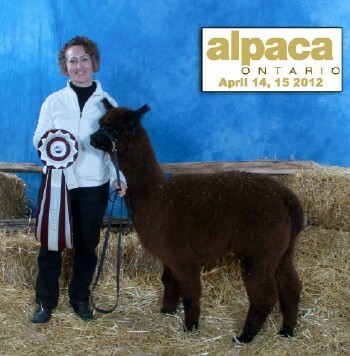 Her 2011 cria Diamond won Champion Black Female at the largest show in Canada! 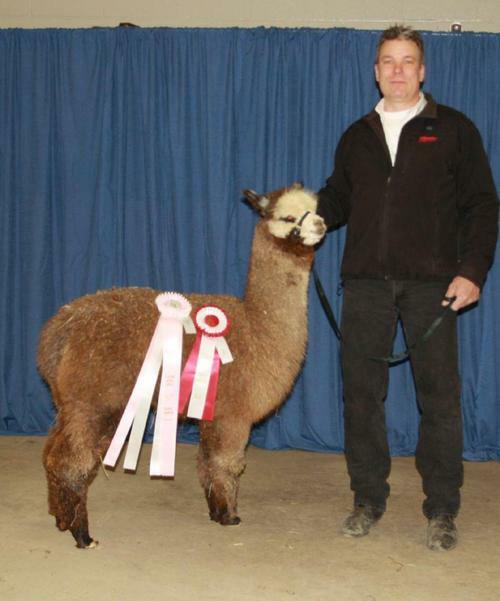 - Alpaca Ontario Show 2012 AND Reserve Champion at the AOA National Show!!! Divina and Grayson have another solid black girl! Dazzle looks alot like her older sister, Diamond. Divina and Grayson have another girl, but this one is grey!!! Diva is spectacular. Divina does it again..another girl, grey! Sired by Oreo. Dahlia is beautiful!!! 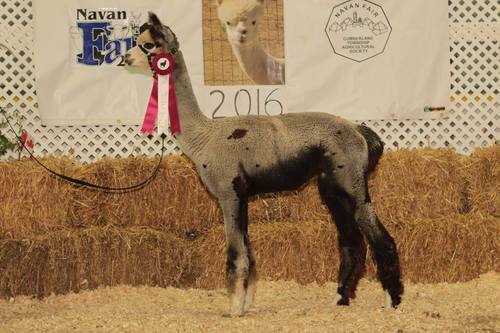 This time a fawn male sired by Grayson. Deangelo looks very promising! 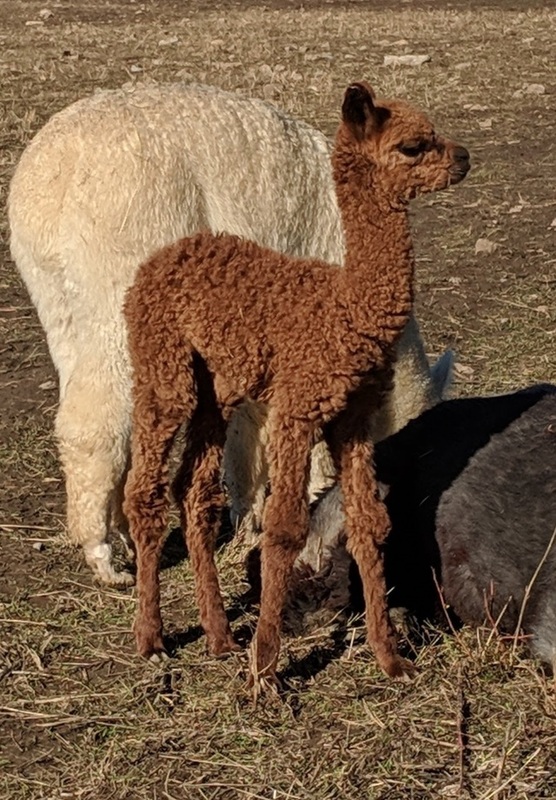 2018 Divina has a male cria sired by A WANTED MAN. Wow this cria is gorgeous!! !